Kaleidoscope Lap Quilt For Sale Original Karen Platt Design. This original handmade design is hand cut, assembled and machine stitched. 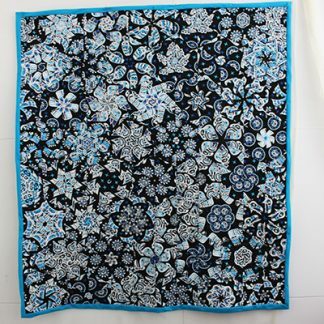 It is made from an original one-off design, there is no other quilt exactly the same, it is unique. It could also be used a wall hanging. It features North American Indian motifs that have been made into hexagons and arranged in a flowing kaleidoscope pattern. 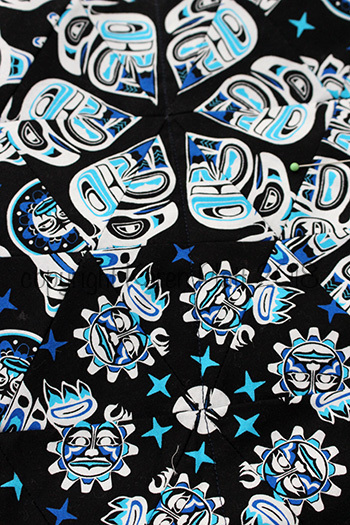 A stunning kaleidoscope quilt design featuring North American Indian motifs. 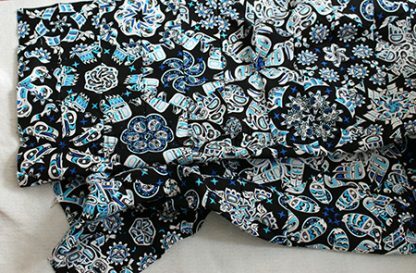 On the back, this quilt is plain black cotton with no border. The front of the quilt is bordered in navy and bound in black and hand stitched in place to the back. The colours used are black, navy, turquoise, blues and white. All fabrics are 100% cotton in this quilt. The wadding (batting) is 80/20 cotton/polyester. The thread is 100% cotton. 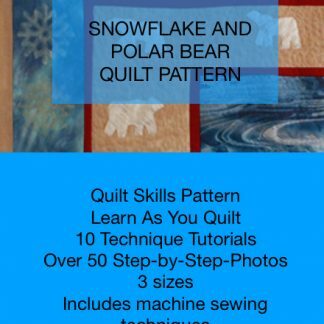 The quilting design is a straight stitch design that I designed to complement the individual elements of the quilt itself, such as the hexagons. This is a unique quilt that is a one-off original. 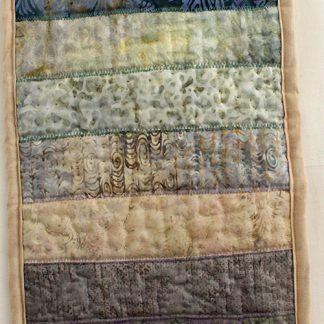 The quilt was designed, cut, pieced, stitched, quilted and finished entirely by Karen Platt. It features a hand sewn label. Measurements: 125 x 102 cm (49 x 40 inches) approx. Ideal as a wall hanging, draping over a chair or lap quilt. The fabric and wadding have not been pre-washed. I recommend hand washing at 30°C or cold wash only. Use Dreft or Woolite and Colour catchers. Line dry or preferably dry flat if at all possible. Do not rub or agitate too much. Lift the quilt carefully, distributing the weight evenly to avoid distortion. 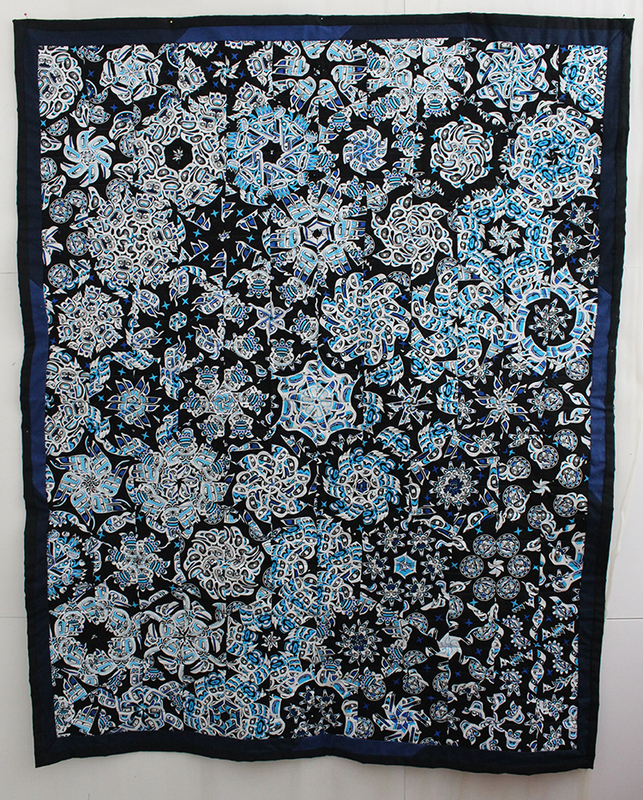 There is a unique one block wonder kaleideoscope tutorial quilt pattern in the tutorial section (ecourses link) of the website, if you wish to learn how I made this quilt. There is no kit for this design.